Supporting data for "Morphometric analysis of Passiflora leaves: the relationship between landmarks of the vasculature and elliptical Fourier descriptors of the blade"
Leaf shape among Passiflora species is spectacularly diverse. Underlying this diversity in leaf shape are profound changes in the patterning of the primary vasculature and laminar outgrowth. Each of these aspects of leaf morphology—vasculature and blade—provides different insights into leaf patterning. Here, we morphometrically analyze >3,300 leaves from 40 different Passiflora species collected sequentially across the vine. Each leaf is measured in two different ways: using 1) 15 homologous Procrustes-adjusted landmarks of the vasculature, sinuses, and lobes and 2) Elliptical Fourier Descriptors (EFDs), which quantify the outline of the leaf. The ability of landmarks, EFDs, and both datasets together are compared to determine their relative ability to predict species and node position within the vine. Pairwise correlation of x and y landmark coordinates and EFD harmonic coefficients reveals close associations between traits and insights into the relationship between vasculature and blade patterning. Landmarks, more reflective of the vasculature, and EFDs, more reflective of the blade contour, describe both similar and distinct features of leaf morphology. 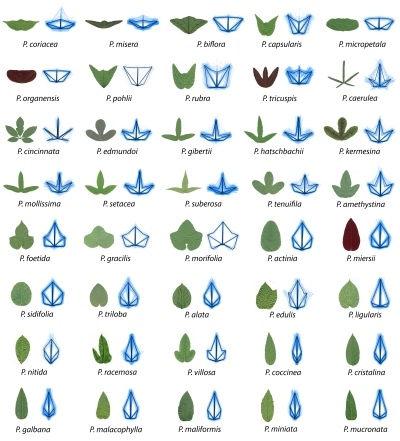 Landmarks and EFDs vary in ability to predict species identity and node position in the vine and exhibit a correlational structure (both within landmark or EFD traits and between the two data types) revealing constraints between vascular and blade patterning underlying natural variation in leaf morphology among Passiflora species. Displaying 1-10 of 555 Sample(s). Displaying 1-10 of 558 File(s).